Earlier this Spring, North Shore Land Alliance, Nassau County and the Roosevelt Community celebrated the launch of the first community garden in Roosevelt, New York. Together, we transformed an old vacant lot into a vibrant garden bursting with organically grown herbs, fruits and vegetables. Thanks to the County and funds from two grants, from the Long Island Community Foundation and the New York State Conservation Partnership Program, we were able to provide gardeners with access to organic seeds, raised beds, tools, an irrigation system and instruction about how to grow their own fresh food. 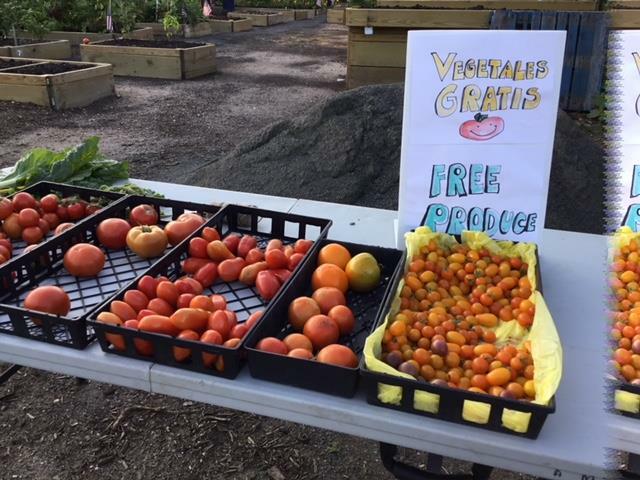 Throughout the season, gardeners and community members harvested a variety of tomatoes, hot and bell peppers, kale, collard greens, lettuce, eggplants and green beans. A few gardeners also planted callaloo, a spinach-like vegetable widely used in Caribbean cooking. Even though schools were closed, educator Catherine Beasley still found time during her summer break to engage schoolchildren and senior citizens at the garden. Keno Williams, a community member and avid gardener, was also hired to help maintain the garden. Each Thursday, Keno and a few volunteers, harvested some of the vegetables and herbs from the community and Roosevelt PTSA plots for a weekly community food share. These events allowed non-members the opportunity to learn about the garden and take home freshly grown food to their families. Later this year during the off-season, the County will install an arbor entryway and fencing along the front of the garden. Gardener’s, local educators and community members are already making plans for the 2019 growing season, which includes planting different types of vegetables, engaging more students and hosting more educational workshops. The Land Alliance is pleased to continue their management of the garden for the 2018/2019 season. After that, it is our hope that a community will have coalesced around the garden and assume ongoing management responsibilities. If you’re interested in learning more about the Roosevelt Community Garden or would like to purchase a plot for the 2019 growing season, please contact Andrea Millwood at andrea@northshorelandalliance.org or 516-922-1028. You can also learn more about the garden at https://www.facebook.com/RooseveltGarden.